Let me just get this out of the way off the top: I am pro-development. Usually. 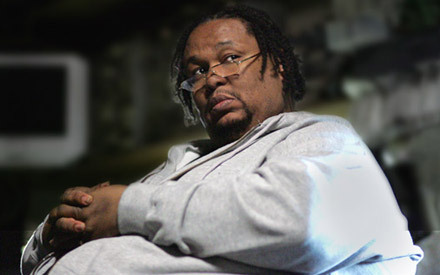 I do think there are a lot of unscrupulous builders and real estate people out there, but no more than in any other industry that is predicated on, as Prop Joe once intoned, buying something for a dollar and selling it for two. Generally speaking there are really only two states of existence for a city and urban centre: growing or decaying. If you are serious about your city, and you love your city (as I generally do), then you understand that stasis is not an option. A city does not get points for existing, for maintaining. It must grow and change, or die. So then, here comes the but. It’s a well-known but, with flashing lights, and funny signs and kitschy merchandise. It’s a but that’s been in the city for 65 years and garnered an entirely earned reputation as a quirky, unique local institution. It’s also a but that has been slowly aging into obsolescence for some time now, parceling off more and more of its former glory. 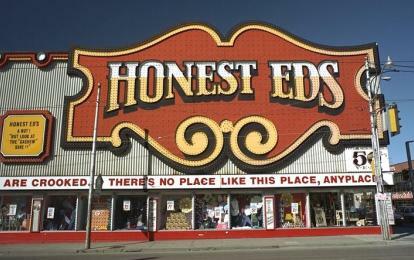 I’ll stop mincing words (and talking about buts); I, of course, am talking about the sale, and eventual closing, of Toronto’s Honest Ed’s. I promise I’m not going to get all romantic about my relationship to Honest Ed’s – I’ll leave that to the aged and the out-of-towners[i]. To me, Honest Ed’s delivered on what its goofy, pun-riddled, hand painted signs always promised: cheap goods. See what I mean? Unromantic. Ah, but it is hard to resist talking about the other half of the story of Ed. Unlike the well-ordered discount stores of today, Honest Ed’s was something of a maze, with stairwells in all sorts of odd locations, and departments laid out with little rhyme or reason (Grocery? In the basement! Electronics? Next to bathroom products!). And sure, upon entry you were greeted by a wall of souvenirs and Elvis busts, but that’s also where you could get some quality crockery and kitchen supplies. We’ve come this far and I haven’t even talked about the huge posters featuring James “Brooks was here” Whitmore and Children of a Lesser God, never mind the walls of autographed photos. It is hard to imagine a person giving a similar fond remembrance when they reflect on their time spent shopping at Walmart. Like Sam the Record Man before it (another semi-kitschy local standard with unique signage), the lights have been dimming on the Honest Ed’s brand. My concern, however, is not regarding the taking down of the famous sign, or even the construction of a new inevitable condominium. (And it’s not even about what kind of big box retail will attempt to squeeze itself in there. I’m looking at you, Walmart, lurking in the shadows.) No, my concern is about all those businesses that exist beneath the glow of the sign, in the shade of Markham Street, tucked into the block known as Mirvish Village. Hang on, here’s where I’m going to start getting a little strident. So the cheesy old dollar store has to go, but what about the rest of the block? What happens now to Sonic Boom, the city’s flagship music emporium, once development plans emerge? That store has already been forced out of its unit on Bloor Street because of a Dollarama; now what cruel irony it would be to get pushed out of the once invincible Ed’s. And what about the Beguiling, the city’s marquee (along with Silver Snail, which also had to move) comic book store and spiritual HQ for the Toronto Comic Arts Festival? How about the run of restaurants that include the eclectic tastes of the Butler’s Pantry, the Cajun styling of Southern Accent and the beautifully reconstructed patio of the Victory Cafe? Is Suspect Video crushed? What about the numerous clothing boutiques? I’m not sounding the alarm just yet. Let’s remember that the land has yet to be even sold. The developers have yet to come swarming in. Is it unlikely to see a Godzilla-sized block of development emerge from the rubble of the former empire of Ed? Just how strong is the Annex character? I worry. 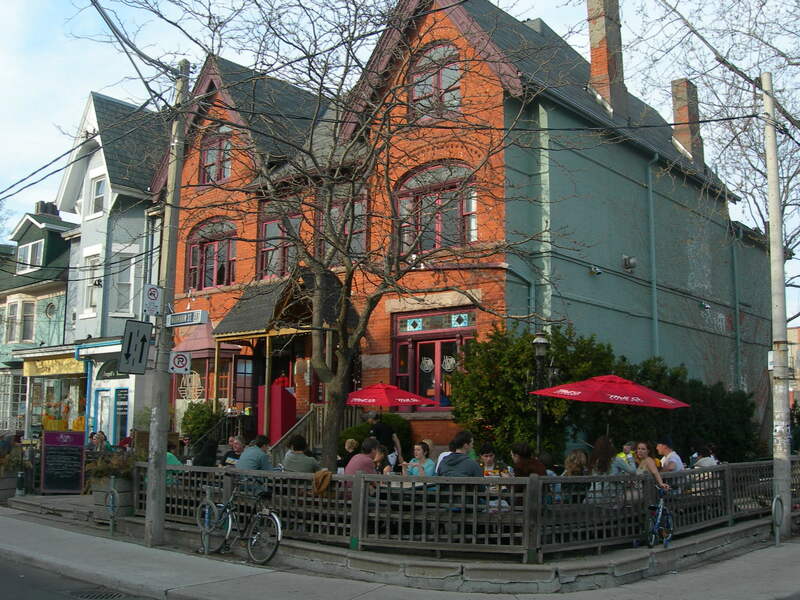 The Victory Cafe: just one of the fixtures of Mirvish Village. I realize the inherent hypocrisy of what I’m suggesting here. I already said I like development, but now I’m suggesting to embrace only the development that doesn’t displace stuff I want to keep. It’s a very convenient stance for me to take, but one hard to uphold. Honest Ed’s and the extended Mirvish Village sit on valuable land and in this city, that is a siren song. Who gets to decide who stays and who goes? Well, the owner, for one. And the owner of Honest Ed’s, David Mirvish, needing funds for his King Street colossus, has watched as the emporium built up by his late father has declined in size and revenue, becoming a museum to a different quaint era, rather than a thriving business. And make no mistake, Honest Ed’s, for all its tales of immigrant support and valuable door crashing deals, is still a business. A business that is now less valuable, and venerable, than the land it sits on. So here is where I will draw the line in my pro-development stance. It is fine if vacant buildings, dying businesses and eyesore empty lots are filled in or replaced. But (there’s that but again), some consideration must be given to those aforementioned stores, that Mirvish Village, still thriving and enforcing the character of the Annex neighbourhood. Should they be tied so completely to the fate of their anchor tenant, tossed overboard to be sunk into the forgotten sea of old Toronto? Moving on from Honest Ed’s is the right choice for the city. Yes, the building and its famous sign have added character to the city for decades, but at a certain point even charming decrepitude loses its charm. A city must change and grow or be buried with its failing business and empty storefronts. Still, one final but: rebuilding and redeveloping should not mean complete erasure. We need to keep our city honest. [i] The only nostalgic story I’ve got comes from my uncle who can recall a time when he was summoned by my grandfather, dressed in some of his finer clothes, and marched down to Honest Ed’s to buy copper piping. Hey, they were going out in public.